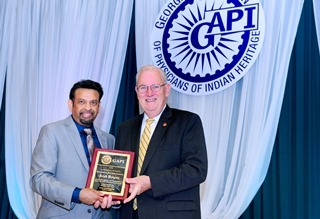 The 27th annual Convention and Banquet of the Georgia Association of Physicians of Indian Heritage (GAPI) was held on Saturday, May 2nd at the Crowne Plaza Atlanta Perimeter at Ravinia, Atlanta, GA. The remarkable year of 2014-2015 led by president Dr. Indran Indrakrishnan and the executive committee with many milestone events culminated in this colorful, grand celebration—a “cherry on top.” The day started with GAPI Board Meeting and well attended medical education sessions. It ended with a lively evening that included magnificent entertainment, inspiring and outstanding speeches by renowned members of the community, and distribution of awards. The board meeting was led by outgoing chairman Dr. Santanu Das. 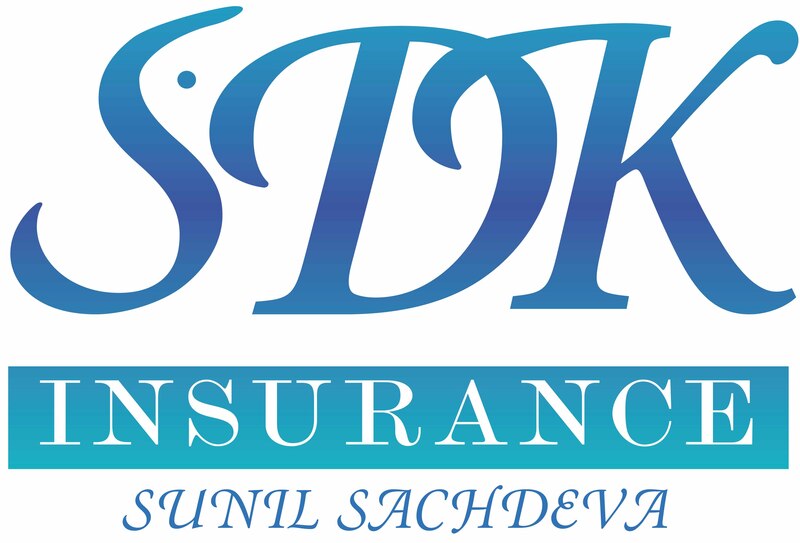 Dr Sreeni Gangasani was elected as new chairman of the board. Medical education sessions were chaired by Dr. P. K. Natrajan and moderated by Dr. Hemant Yagnick. Fascinating topics included Telemedicine for Rural India, Cyber Threat in Medicine: Risky Bites, Current Trends in Medical Practice Ownerships, Familial Hyperlipidemia, and Anemia Workup for Primary Care Physicians. The ever awaited banquet was full of vigor and laughter with distinguished guests, community leaders, members, spouses, and friends mingling and socializing. The venue was filled with over 400 attendees. The grand décor, elegant lighting, and soothing music welcomed ladies and gentleman in their best colorful formal wear. 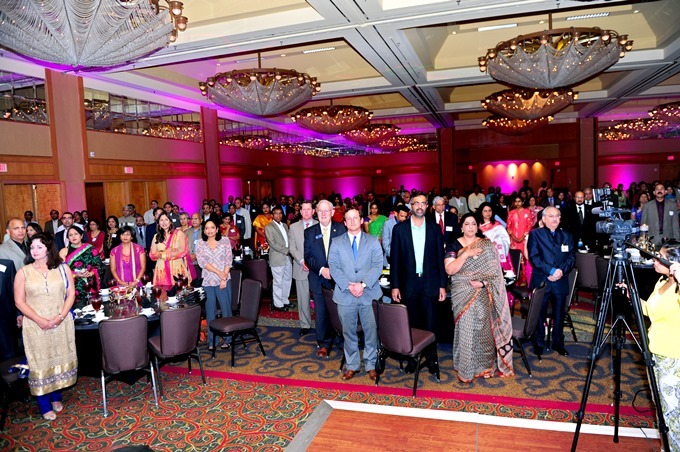 Many dignitaries including Secretary of State Mr. Brian Kemp, Insurance Commissioner Mr. Ralph Hudgens, Assistant Insurance Commissioner Mr. Jay Florence, Acting Consul General of India R. Srinivasan, President of Medical Association of Georgia Dr. Manoj Shah, and CEOs of Gwinnett Clinic Ltd, Drs. Meena & JJ Shah graced the event. Indian and US national anthems were beautifully sung by Emory University students Tejal Pandharpurkar and Arooj Khalid. Emcee Rina Gupta kept the audience captivated with her touch of humor and dynamism. Disciples of Smt. Uma Pulendran of Natya Dhaara gave an enthralling dance performance: two beautifully choreographed fusion pieces, a prayer for Lord Ganesha, and a dance on Lord Nadarajah. The other splendid part of entertainment was the popular songs by Junior Champion Koyal Ansingkar and the Senior Finalist Sandeep Kowtha from IACA’s 2015 Atlanta Indian Idol event. Both singers were well applauded on their melodious songs and admired for their talent and courage. 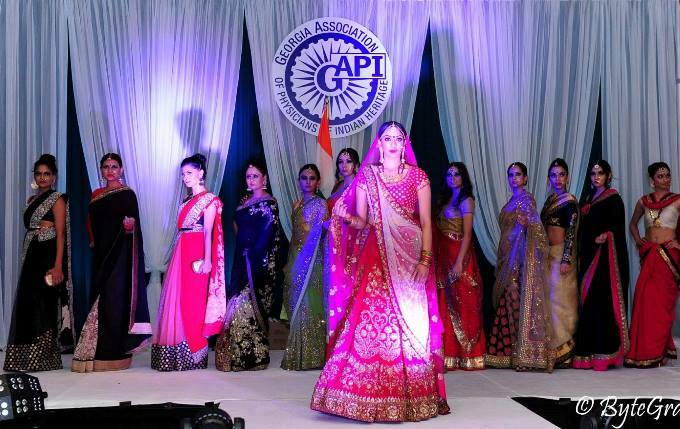 Grand finale of the entertainment was the fashion show by Bollywood Closet Atlanta which presented the collection from world renowned designer Sabyasachi Mukherjee. Fusion music created specially by popular DJ from India, exquisite light effects, and specially choreographed sequences showcased the top super models in beautiful sarees and lehengas—the audience was mesmerized. An interesting part of the entertainment was an interactive pop quiz sprinkled at the audience testing their knowledge on the history of GAPI throughout the evening. It was well received and correct answers were awarded with prizes. Engaging and informative speeches by the dignitaries followed. 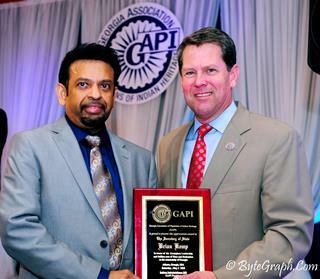 Chief guest, Secretary of State Brian Kemp thanked GAPI for its admirable community involvement and stated the services by GAPI not only make Georgia a better place, but truly have a global impact. He assured ongoing communication in the future with GAPI for better service to the Georgian community. Guest of honor, Insurance Commissioner Ralph Hudgens spoke about recent developments his office has made regarding the unfair physician contracting practices of several of Georgia’s largest health insurance companies. 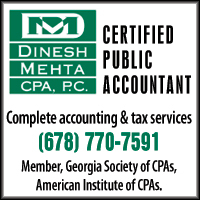 Dr. Manoj Shah, the first Indian descent President of Medical Association of Georgia (MAG) said that MAG is involved in many activities such as advocacy in legislation at state and federal levels, in courts, and in governor's office. Professor Sagar Lonial, Executive vice chair of Emory Winship Cancer Institute, spoke about how his parents brought him as a child to US and instilled Indian values of hard work and helping others which paved the way to finding success in his career. He proudly informed attendees that Winship Cancer Institute of Emory University is the only NCI-Designated Cancer Institute in Georgia serving Georgians through education, research, prevention, and cancer care with over 250 active clinical trials seeking out new ways to defeat cancer. 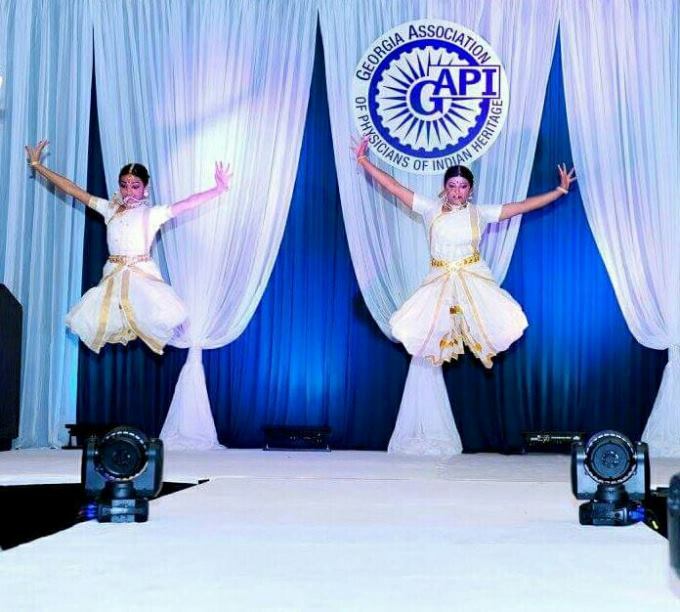 GAPI announced and distributed many awards. Ms. Veena Rao, publisher /editor of NRI Pulse, received the media award recognizing her exemplary contribution to society through her journalism. 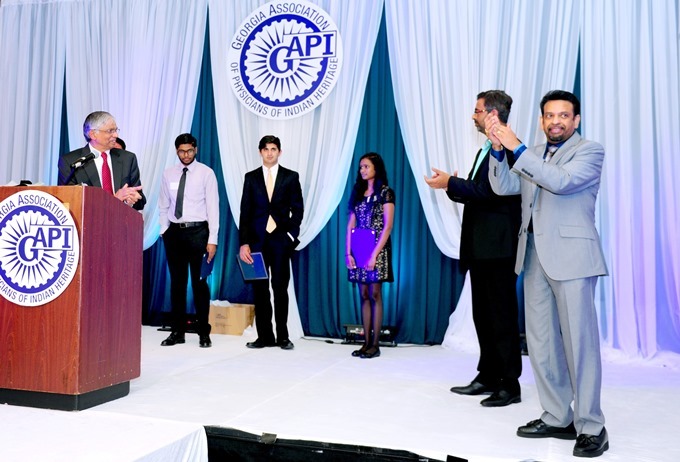 Recipients of student scholarships were Arora Sahil, Banergee Anurag, Mylarapu Namratha, and Patel Sagar based on their academic and overall excellence. Humanitarian award recipients were Mr. Stephen Daniels and Ms. Basnet Manikala. Mr. Daniels is one of the founders of Meals by Grace, a nonprofit organization which feeds many underprivileged school children who otherwise go hungry except for food they get at school. Ms. Manikala is a tireless volunteer for Bhutani refugees’ welfare. 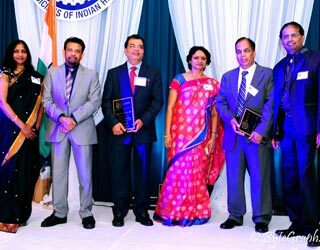 Acting Indian Consul General Mr. Srinivasan presented the certificates and monetary award of $1,000.00 for each person and congratulated the awardees. GAPI president Dr. Indrakrishnan thanked the organizations which worked with GAPI in conducting many successful social and fundraising events over the last year. 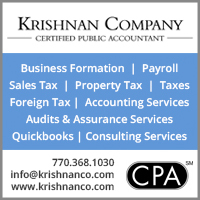 This included APPNA, IACA, Third Eye Dancers, Soldiers’ Angels, Tapestry, BAPS, and India Cultural Exchange of Emory University (ICE). He especially appreciated Indian Consul General’s Office for their kindness in closely working with GAPI in their many official events including visits of Prime Minister Mr. Narendra Modi, Health Minister Dr. Harsh Vardhan, Indian Foreign Secretary Mr. Jaishankar, and Spokesperson in the External Affairs Ministry Mr. Vikas Swarup. He appreciated the help and guidance from the GAPI Executive Committee, Board of Trustees, Board of Directors, local media, and other wellwishers in making his tenure a memorable one for GAPI and the community. He also thanked the Winship Cancer Institute of Emory University, the grand sponsor of the event, and all other sponsors for supporting this grand event. He then introduced the new GAPI executive team for 2015 -16: Dr. Sudha Tata (President), Dr. Vijay Maurya (President- elect), Dr. Raghu Lolabhattu (Secretary), and Dr. Syamala Erramilli (Treasurer). Even in the midst of an incredible evening of enjoyment, the pain and suffering of people of Nepal struck by earthquake were not at all forgotten. Dr. Prashant Garimella made an elaborate presentation as to the plight of this community and initiated a fund raising campaign on the floor. 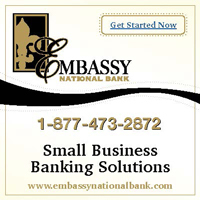 More than $3,000 dollars was collected within a few minutes as seed money and the efforts will continue with more philanthropic activities for long term rehabilitation. The lovely evening ended with a scrumptious dinner provided by Urban Spice followed by DJ and dance. ByteGraph provided audiovisual service and stunning lighting effects. Grand decorations were elegantly done by Sterling Décor.